Kansas City, KS dons some of the merriest decor in all of the metro. Located at the center of Legends Outlets Kansas City is a 45-foot Christmas tree complete with an extraordinary display of blue twinkling lights.During the month of December, downtown Kansas City, KS is decked in bright lights and snowflakes. In front of city hall you’ll find a gigantic, lush green tree with beautiful red and gold bulbs. 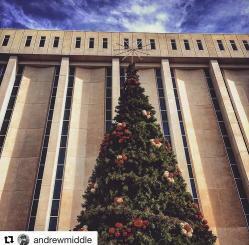 Both of these trees are unique to any other tree in KC, which makes them the perfect setting to capture your holiday #KCKselfie! 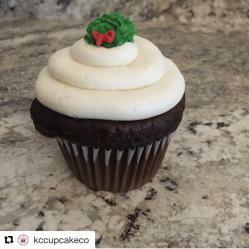 butter cream frosting to create the decadent Candy Cane Cupcake. You can find a way to celebrate with your loved ones every weekend in December! Hop aboard Santa’s Express at the National Agricultural Center & Hall of Fame, and ride to the depot to pay visit to the jolly fellow himself. Wake up early to enjoy a breakfast buffet, raffles, crafts and more at T-Rex Café & Restaurant’s Breakfast with Santa. Strawberry Hill Museum’s Olde World Christmas is a seasonal staple for many Kansas Citians. Throughout December and January, the beautiful Victorian mansion is adorned with elaborate decorations and displays that depict holiday traditions from around the world. Check out what else Kansas City, KS has to offer this month here.